According to the Florida Highway Patrol, the wreck occurred near the intersection of Parsons Road and West MLK. For reasons that are still unclear, 81-year-old Hubert Anders, of Dover, crossed from eastbound MLK onto the westbound side. His F-250 collided with a Harley Davidson and pushed the bike into a trailing Silverado. The motorcycle rider, 50-year-old James Barnhardt of Plant City, sustained serious injuries and was subsequently declared dead at a local hospital. The F-250 left the road and careened across two parking lots before it finally slammed into a utility pole. Broken Bones: As bikers fall off their motorcycles during collisions, they naturally extend their arms to break their falls. As a result, their arms almost literally snap. These injuries require very aggressive surgery and extensive physical therapy. Road Burns: Although these large, painful abrasions are usually not life-threatening, there is typically no cure other than time. Road burns seriously limit mobility and often never entirely heal. Internal Injuries: The crash forces usually cause internal organs to grind against one another. The resulting internal bleeding may continue for quite some time. Emergency responders are often too busy dealing with external trauma injuries to quickly stop internal bleeding. 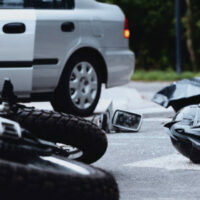 Damages in Florida motorcycle crash cases usually include compensation for tangible losses, such as lost wages, medical bills and intangible losses, such as pain and suffering. Many times, as in the above story, there are multiple tortfeasors involved in a car wreck. Under the foreseeability rule, either one could be liable for damages. When there is more than one tortfeasor, Florida judges usually apportion damages among them based on their percentage of fault. When a driver completely loses control of a vehicle yet it continues moving, it is fair to speculate that the driver suffered a medical episode while driving. These situations often involve either negligence per se or a traditional negligence claim. That violation substantially caused the damages. Many individuals lie about their medical conditions when they renew or obtain their drivers’ licenses. So, their licenses may be technically valid. Nevertheless, they may still be negligent. If the tortfeasor demonstrated a lack of ordinary care, and lying to the DMV certainly qualifies as such, liability may still attach. Motorcycle riders face extreme danger on Florida roads. For a free consultation with an experienced personal injury attorney in Tampa, contact The Matassini Law Firm, P.A. We do not charge upfront legal fees in negligence cases.